Just two weeks ago yesterday, I was in the hospital. Don’t worry, nothing serious. Totally routine, completely planned, in and out in a single day, surgery. 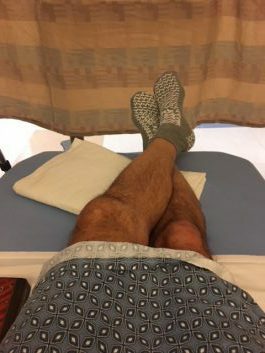 I was, however, “put under,” which means that they pay close attention to what you’re wearing, what you’ve eaten and, of course, your vital signs. In the four hours I was there, they took my blood pressure and temperature at least five times (and that was just while I was conscious). The blood pressure measuring system appears to be the same as it’s always been: Velcro thing on your bicep, stethoscope against your arm, squeeze a few times to tighten it all up. Ten seconds later they tell you the numbers. It’s been the same for my entire life. I wouldn’t be surprised if Abe Lincoln’s doctor used the same tools. When I was growing up, they stuck a mercury-filled piece of glass in your mouth (or wherever) and came back a few minutes later to have a look. Eventually, they switched to an electronic thing in your mouth. Then they started sticking something in your ear. This time? They pushed a device against my temple and swiped it down towards my chin. I figure it’s only a matter of time before they’ll just drive by my house to get an accurate reading. So here’s my question for you: Why do they keep improving body temperature measuring technology? Better accuracy? Maybe. But I don’t think I’ve ever come in at 98.6 exactly anyway, and nobody seems to care. So I have to assume they are satisfied with a wide range. More speed? Again, maybe. But cutting 10 seconds down to one second is of little value to me. I’m sitting here completely naked under a “johnny.” Where the hell am I going in a hurry? More sanitary? I suppose. But it seems to me that if you can’t clean a thermometer properly, maybe you shouldn’t be in the business of cutting people open in the first place. The point is, and even though I’m confident there are all kinds of valid, important reasons for steady improvements in the technology that matter a great deal to the hospital, from the patient’s perspective, we don’t much care. Now, imagine you’re trying to get me, the patient, to buy your new thermometer technology. You tell me it’s more accurate. It’s faster. It’s cleaner. Maybe it’s even cheaper. But I’m not buying. In fact, I’m not even paying attention to anything you’re saying. Why? Because you are solving a problem that I don’t think I have. And that, my johnny-wearing friend (note: the opening goes in the back), is one of the primary reasons why your marketing isn’t working. Most professionals – indeed, most small businesses – spend way too much time talking about their credentials, their methodology, their commitment, their history, the service itself … without first making sure that what they’re offering aligns with an existing need. Don’t all those other things matter? Sure. But all of that is secondary to demand. The more what you are offering lines up with an existing, recognized and urgent problem in the eyes of the buyer, the less skilled you need to be at marketing, let alone selling. First, pay careful attention to what clients and prospective clients say. What are they concerned with? What problems drive them crazy? What specific words and phrases do they use to talk about all this? Note that the question is not: What do you think they should be concerned with based on your experience, perspective, research, or whatever? If you have to convince me of a need before you convince me to hire you – even if you are one hundred percent right – you’ve just made closing a sale a whole lot more complicated. Find the demand that’s already there; don’t try to create it. Second, modify your marketing language using those same words and phrases. Tweak your web site, your LinkedIn description, the way you describe your work in networking meetings. Try to make it line up with the way prospects already talk about the problems they already know they already have. Here’s the bottom line. Being faster, better and cheaper only matters to the extent that I want what you’re offering in the first place. Absent that, all the marketing in the world isn’t going to make me pay attention, let alone write you a check. Look for demand first. Then go to work on the rest. Have you ever worn a johnny with the opening in the front? Explain. Do you think Abe Lincoln paid his doctor with five dollar bills, just to impress him? What’s the single biggest problem your prospective clients have? If you liked this article you’ll love the next one (I’ve been holding back on the good ones until you subscribe). Click here to sign up for future posts. This is the same mistake job search candidates make: “I can do this, this, this, that, that, that, and this other thing! Hire me!” when instead they should be aligning with the need, as you say here, Michael. Thank you for giving me a better way to say this very thing to them! I agree with everything you’ve said, and yet I can’t help but think about Apple. How can they make a bunch of stuff you didn’t know you needed and make a ton of money in the process? I think the key difference is that Apple spends about $900 million a year on advertising. So not to say that demand can’t be created, but not by people like us! So much easier to find an existing need and make sure the way you talk about your work lines up with that. 1. When you get a mammogram, they provide a short cape with an opening in front. One must be careful to keep one’s arms down to avoid flashing. Note they have also changed blood pressure testing equipment. At one doctor I visit, they put a cuff around my wrist and have me cross that hand over my heart. 3. The single biggest problem potential clients I have encountered is not knowing or admitting or caring they have a problem with the written material they are sending into the world. I no longer attempt to persuade such people to hire me. Real prospective clients know they need writing help, typically because they lack the internal staff to do it all themselves. I’m glad the blood pressure people are hard at work as well!